What do you do if you need more space in the family home? Perhaps you have a teenager who wants to play loud music and needs their own area of the home. Or maybe you're about to have another child and you need another bedroom? Possibly, your parents are getting older and need to spend some more time in your home. Whatever the reason, one of the smartest and most cost-effective ways that you can add space to the home is to build an extension. This means little disruption to daily life, while making your home that much bigger. Today, we are going to show you how Edinburgh architects Urban Creatures created a zinc extension to a family home. Not only does it blend seamlessly into the original design, but it adds a light and bright living area to the home, which can be used for just about anything! In this case, it has been used for a dining area. This modern and attractive space is simply flawless. 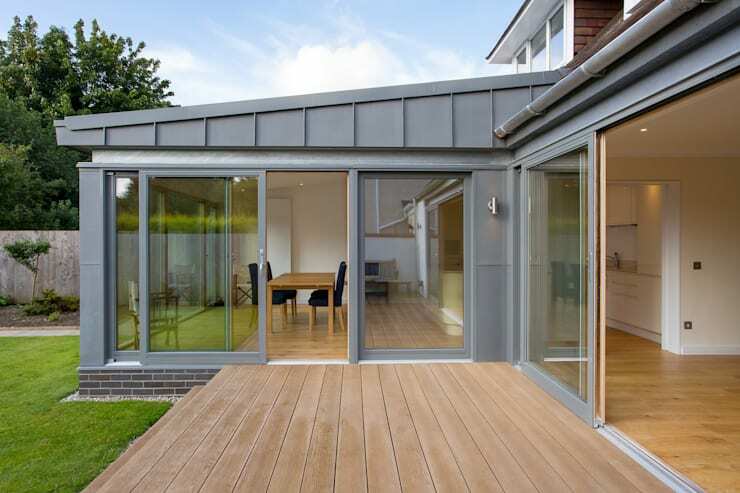 Perhaps after exploring this project, you will not only see just how gorgeous a cheaper material like zinc can look but you will see just how effortless a home extension can look. From this angle, we can see how the original house flows into the zinc extension, merging the traditional with the modern. The whole one side of the house features large glass windows and doors, allowing the home to spill out onto the spacious garden. The grey door frames are consistent throughout, connecting the new section of the home with the older section of the home. 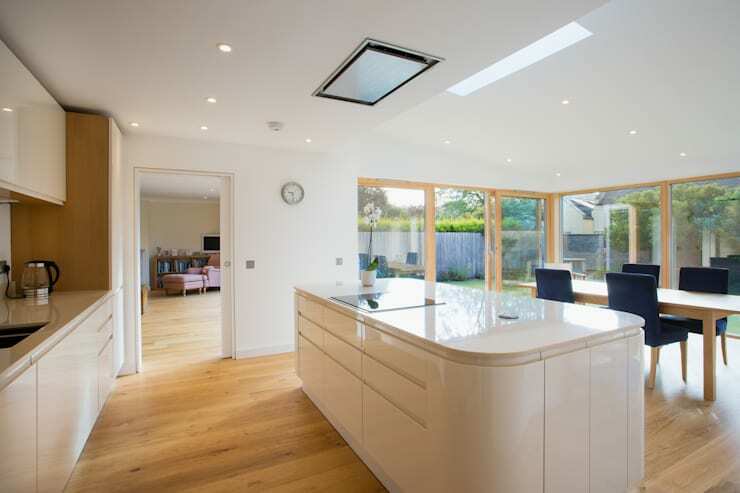 The extension fits snugly onto the left-hand side of the home. The designers have truly made the most of the property size! Do you see how trendy zinc can look? From this angle, we can see how the home extension opens up onto a little wooden terrace. There is a wonderful integration between interior and exterior spaces, allowing for plenty of space for the family to enjoy the sunshine and fresh air. 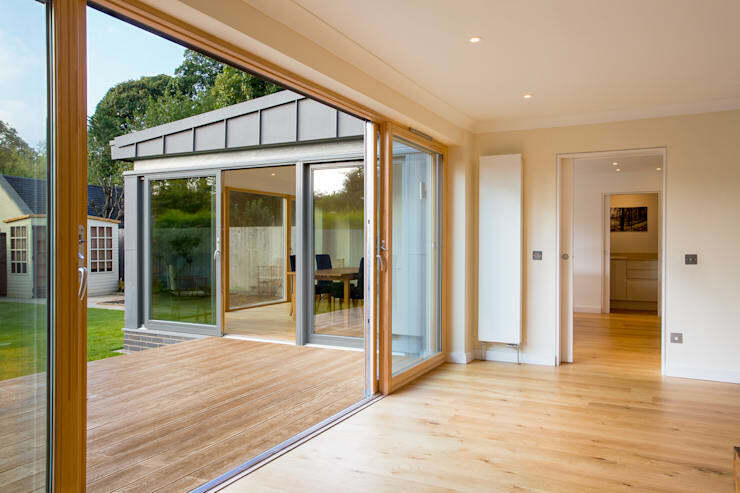 The large glass sliding doors of the home extension can be opened, allowing the inside room and the terrace to merge into one, large area. These are truly multi-functional areas that can be used for relaxing, socializing or quality family time. 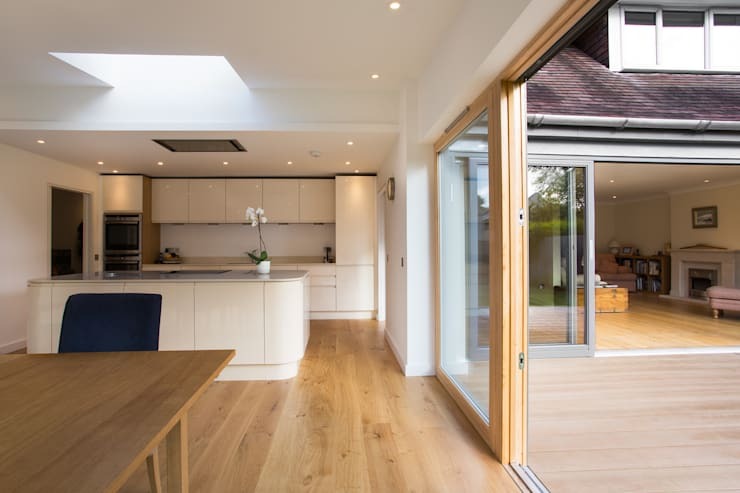 The extension has been used for a dining area, which receives plenty of natural light, which flows in through the large glass windows and doors. The natural light bounces off the light wooden floors and white walls, making for a very attractive area. Have a look at these tips for bathing your home in natural light to achieve the same look in your own home. The original living spaces of the home are connected to the extension as well as the outdoor terrace, which we explored in the previous home. This creates a wonderful fluidity between the living areas thanks to the open plan design. Not only does this make for a social and engaging environment, but it also makes the home seem that much bigger and more spacious. We can see how the neutral tones throughout the living area, including the wooden floors and white walls, make for a very appealing design. Do you see how the designers have included skylights in the roof throughout the home as well, allowing sunlight to flow into the interior space? Before we take one more look at the home extension, we just want to point out how valuable a kitchen island can be to an open plan home. It subtly separates the cooking area from the rest of the home, without impacting the fluidity of the living spaces. It also adds an extra surface area to the kitchen, and in this case, a stove top! This makes for a very neat, organized and functional space. What's more is that it adds extra storage space to the cooking area, allowing for cutlery, crockery and utensils to be stored neatly out of sight. This means only the most necessary of items are on display, making for a beautifully practical kitchen area. Have a look at these kitchen islands to treasure for some more ideas! Before we go, we take one last look at this modern addition to the home. It seems so natural and flawlessly connected that you wouldn't even notice that it was a new addition! The grey zinc is also very elegant and subtle, working in harmony with the rest of the neutral tones and colours. Could you imagine a more pleasant dining area, where sunlight flows in throughout the day? You'll also notice that the extended area features very simple furniture, with a slightly minimalist look and feel. This allows the beauty of the architecture and the surrounding garden to remain the star of the show. If you've enjoyed exploring this home, you'll love this one too: Expand your home without spending a cent on an extension. 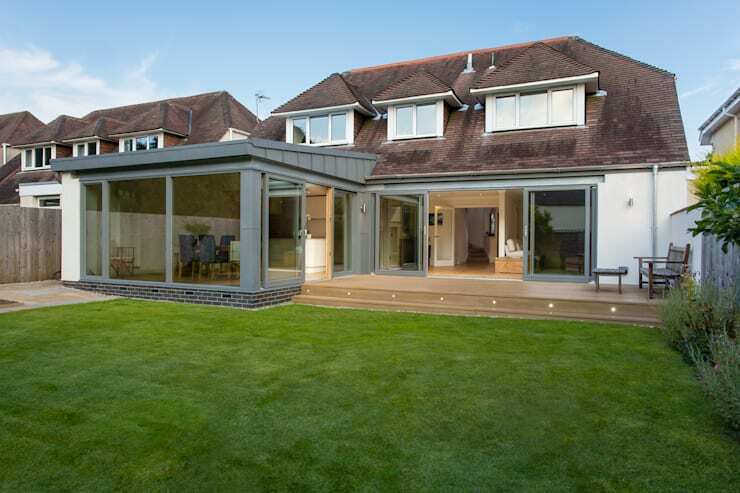 Are you impressed with this modern home extension?